You can change it at any time and store it in the sealed case which keeps it closed once it has been opened. You can obtain different fragrance cartridges from CITROËN dealers. Do not discard the original cartridge as this serves as a plug when no fragrance cartridge is in use. In order to preserve the service life of the cartridge, turn the dial fully to the left when you no longer wish to diffuse the fragrance in the passenger compartment. 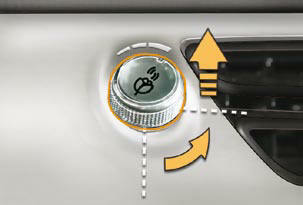 As a safety precaution, do not carry out any action on the cartridge while driving. Do not dismantle the cartridges. Do not attempt to refi ll the fragrance diffuser or the cartridges. Use genuinel CITROËN cartridges only. Press the dial and turn it a quarter of a turn anti-clockwise. Refi t its sealing case. Remove the cartridge from the sealing case. Install the cartridge (fl ower at top left). Press the dial and turn it a quarter of a turn clockwise.